New Zealand’s majestic South Island offers a prize formula of active adventure and sublime recovery. With meandering running trails skirting lakes and rivers, sweeping hills perfect for hikes and grand cycling adventures from mountain to sea, New Zealand’s South Island promises plenty for those seeking an active holiday. Coupled with an array of magnificent food and wine to sustain you along the way, and countless spas and bubbling springs to rejuvenate tired limbs, the South Island has struck a winning balance between adventure and relaxation. From top to toe, here are three combos that bundle both. Flanking the eastern shores of Tasman Bay, Nelson is brimming with golden beaches, quality seafood and wine, and artistic energy. It’s also a one-stop shop for those hankering for a big slice of the great outdoors. The Great Taste Trail is an easy purpose-built cycle trail soaking up panoramic views of Tasman Bay and the Western Ranges. Whether it’s a slow-paced day trip or a multi-day experience, up to 175 km of trail await. Spot the white heron while cycling past the Waimea Estuary or pop into the towns of Mapua and Moteuka for cafes, restaurants and wineries. The Abel Tasman Coastal Track requires only light walking shoes for the 50 km route lined with endless golden beaches. Break up the journey at one of five huts or 21 campsites that dot the track, with transport arranged from either end. An exclusive high-end lodge dedicated to wellness, Split Apple is a haven of good health nestled above famed Split Apple Rock. Surrounded by the pristine Abel Tasman National Park, retreat owner Lee Nelson is a retired doctor passionate about nutrition and relaxation. While all the trimmings of a luxury lodge await, Split Apple is big on equipping guests with the tools to make lasting health changes. Take a cooking class focused on gourmet functional food, have your own wellness evaluation and indulge in a host of massage and spa treatments. Blessed with high sunshine hours and a moderate climate, Marlborough is a magnificent nature playground home to the famed Queen Charlotte Track. 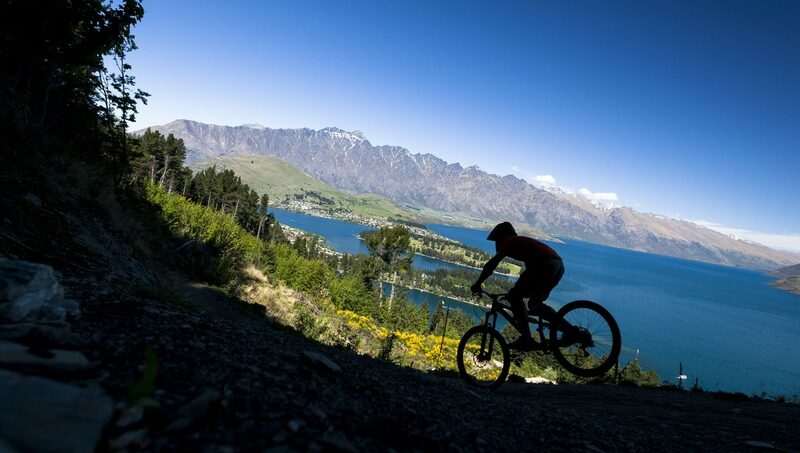 New Zealand’s most popular ‘great walk’ is open to mountain bikes from March until November. The 71 km track is a two to three day ride for intermediate to experienced mountain bikers, and highlights the region’s stunning coastal landscape, diverse native bush and wildlife. It also has comfortable lodge accommodation and a pack carrying service. Whether you tackle the length of the track and camp along the way or make it a day-trip, immerse yourself in the spectacular Marlborough Sounds on foot. Discover lush coastal forest, historic bays and breathtaking views of Queen Charlotte and Kenepuru Sounds or stop off for a spot of fishing or sea kayaking along the way. Bay of Many Coves is Marlborough's award-winning luxury retreat in Queen Charlotte Sound. Wrapping the shoreline, nature is all around and the resort radiates a peaceful calm. Treat yourself at its fine-dining restaurant, watch sea kayakers from the deck of the licensed cafe or take it all in with a glass of sparkling on the balcony of your room. Those giving their feet a rest for the day can soak in the cedar hot tub or mix it up on the water with one of the many cruising and yachting opportunities close by. Queenstown is a small alpine resort with a huge reputation. Rated as one of the world’s top holiday spots, it’s a dream destination for those seeking an active holiday. With biking trails for all skill levels, dabble in a little history on Skippers Canyon trail or tackle the challenging descent of Bob’s Peak. Opened in 2012, the Queenstown Trail has close to 100 km meandering through some of the most breathtaking scenery around. Take in the Gibbston wine area, gold mining town of Arrowtown and beautiful landscapes of Lake Hayes and Frankton. The Routeburn Track offers keen hikers some of the most diverse scenery around. Head out for a hike and soak up the forests, alpine flora, lakes, several waterfalls and panoramic views. The three-day trek covers 39 km. Overlooking glacial-fed Lake Wakatipu near Queenstown, Aro Hā Wellness Retreat aims to refresh, rejuvenate and reignite all those who walk through its timber-clad doors. Where nature, adventure, fitness and wellbeing collide, it’s zen luxury at its best and focuses on bringing people together and on the path to betterment.